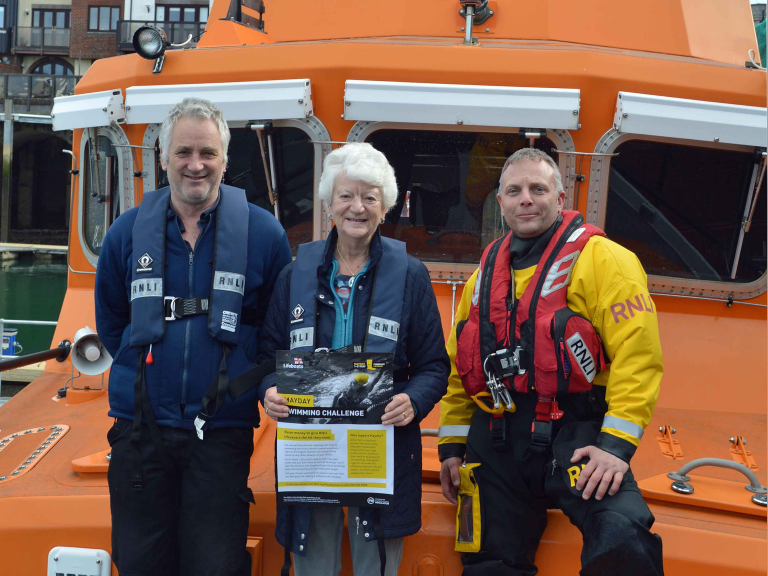 Launching on Wednesday 1 May and running for the whole of the month, the RNLI’s Mayday campaign is calling on people to ‘do their bit, fund our kit’ with the lifesaving charity hoping to raise £700,000 to fund the crucial kit volunteer crews rely on, like lifejackets, helmets and the RNLI’s iconic yellow wellies. Alongside other events taking place across the region, those in the south west can sign up for a Mayday swim challenge. Whether you fancy taking on the ultimate challenge of swimming the Channel, or the length of your local beach or river, anyone can enter and can opt to swim any distance. And you don’t have to swim the full distance in one go – simply split your chosen distance into lengths and keep going until you reach your target. Trish Veale from Saltash in Cornwall took on the Mayday swim challenge in 2018. Trish, who regularly swims at her local leisure centre, decided to swim the five mile distance between two local landmarks Rame Head in Cornwall to the Mew Stone off Wembury in Devon, a total of 320 lengths. Trish raised an astonishing £500 by asking friends at her ladies choir and local sailing club as well as family to sponsor her challenge. Trish says; ‘I’ve been swimming for about 20 years, doing about 30-40 lengths a few times a week. I chose a manageable distance to swim over three weeks and just added an extra 10 lengths to each of my sessions. Trish says she was astonished by people’s generosity. Henry gives some helpful tips to make the most of your RNLI Mayday Challenge. Plan - Whether you're completing your Mayday swim in one attempt or ticking it off over multiple sessions, break it down in to chunks make the challenge more manageable. To achieve a long continuous swim then consider taking someone to count the lengths for you so that it's one less thing to worry about. Leisure centre lane swimming sessions can sometimes be busy, tell a leisure assistant about your plans and ask for their advice on when's the best time to swim so that you have the space you need to go at your own speed. Don't forget to tell them it's for charity! Prepare - Whether you're a seasoned swimmer or just dipping your toe in the water, making sure your body is ready to take on what you're asking of it is vital. Conduct a warm up on the poolside before you start swimming. This could involve jogging on the spot, getting your arms moving and generally 'limbering up.' You'll be getting in to the water with a better range of movement to help your technique and it'll help to avoid injury. Try to breathe off to the sides without lifting your head as you'll make your legs sink which will slow you down. Practise keeping your body level in the water, look down towards the bottom as you swim and kick your legs. With each stroke make sure you're pulling all the way through to your hip, you're trying to get the maximum distance out of each pull in order to conserve energy.